I plan to use the Enforcers from Mantic Entertainment’s Deadzone wargame as miniatures for playable androids in my upcoming Science Fantasy game. I decided to make the next Enforcer a tribute to one of the mechanical characters from Phantasy Star Online. Can you guess which HUcast inspired this? Adding the biosword was the first major modification that I made to a miniature and I learned a lot. One challenge is that the biosword was metal while the enforcer was plastic. I did prime the biosword with thinned white Gesso. I did this modification without pinning or kneadatite which made it significantly harder than it needed to be. I used modeling putty from the local hardware store to add the hands. Incidentally, the large biosword is a metal conversion piece from Secret Weapon Miniatures. Before varnishing I applied a red wash to the biosword to give it a more biological feel. 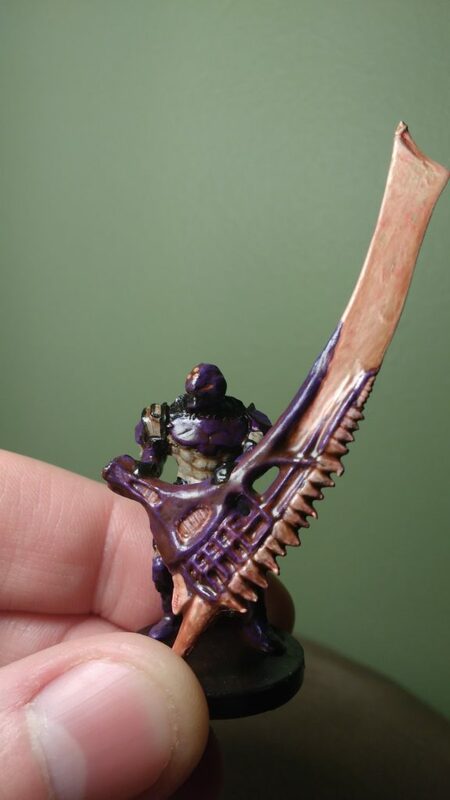 I think that this miniature is a fun tribute and will make for a great nonplayer character.